ü All of us have heard and seen the eclipses. ü Sometimes we cannot see the Moon or the Sun totally or partially. ü Is something is obstructing the view? ü This is what happens and while we look at the Sun or the Moon some object or shadow comes in our way. ü We will not be in a position to see the Sun or the Moon. ü As the eclipses are caused by the casting of shadow of one heavenly body on the other, there is an occurrence of cone shaped shadow. ü The inner cone shaped part of the shadow is called umbra. ü The outer part of the shadow is called the penumbra. ü The total solar eclipse lasts not more than 7.5 minutes. We are concerned with 2 types of eclipses. 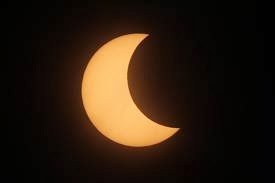 v Solar Eclipse (The Sun is not visible). Please remember. The Moon is coming in between the Sun and the Earth. v The Sun and The Earth. e Moon is bound to come between the earth must be in a straight line. This is called synergy. e Moon are on the same side of the Earth. v Lunar Eclipse (The Moon is not visible). What happens here? The Earth and the Moon replace each other. It means the earth comes in between the Sun and the Moon. Is this clear? Very simple. Isn’t it? v The Sun and the Moon are on the opposite sides of the earth. Now let us discuss this in detail. 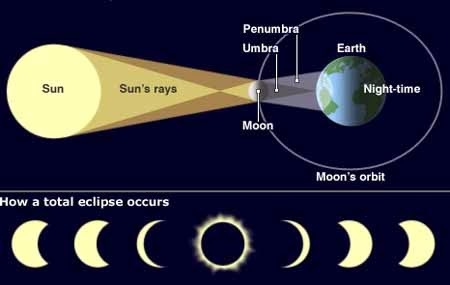 For both Solar and Lunar eclipses the Sun, the Moon and the earth must be in a straight line. This is called syzygy. ü The Moon revolves around the earth. ü Due to the revolution the Moon is bound to come between the Sun and the Earth. 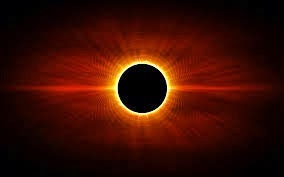 ü Solar eclipse occurs only when the Sun and the Moon are in conjunction. ü Conjunction means that the Sun and the Moon are on the same side of the earth. 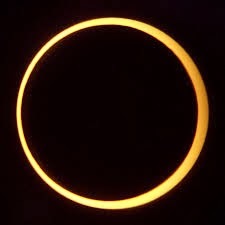 ü Solar eclipse occurs on the new moon. ü During this time we cannot see the Moon as the illuminated part of the moon faces towards the Sun. (away from the earth). ü Depending on the Moon’s obscure (coverage) of the Sun the eclipsed is classified into 3 types. ü The apparent diameter of the moon is equal to the apparent diameter of the Sun. ü The apparent diameter of the moon is greater than the apparent diameter of the Sun. ü The apparent diameter of the moon is smaller than that of the sun. ü The moon cannot obscure the sun completely. ü The Sun is visible as a ring around the edge of the moon. The umbral shadow passes across the surface of the earth. This path is called Zone of Totality. The length of the zone is 260 km wide. only from the Zone of totality. ü Here the total eclipse cannot be seen. ü The part sun is visible. ü If we look at the eclipse from either side of the zone of totality only a part of the sun is seen and this called the Partial eclipse. The Lunar eclipse when the Sun and the Moon are located on the opposite sides of the earth. This means the Earth is in between the moon and the sun. The moon revolves round the earth. In this process the earth is bound to come in between the moon and the sun. During this process the moon is obscured as the shadow of the earth is cast on it. During this time the face of the moon is towards the earth. Hence the lunar eclipse occurs on full moon day. 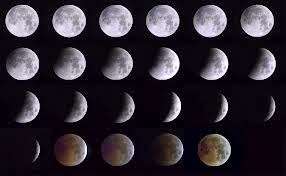 § The eclipses (solar or lunar) occur on every new moon or full moon day. (Incorrect). ü This occurs when the entire moon passes through the umbra of the earth’s shadow. ü The moon does not completely enter the umbra. ü A part of the moon is moon remains visible. ü During this the moon passes only through the penumbra of the shadow of the earth. Do you know what saros period is? The eclipses of the same type repeat after an interval of over 18 years. The Sun, the moon and the earth return to almost the same relative positions.